It’s well-known that young hero Bellamkonda Sai Sreenivas is currently shooting for an action entertainer titled Saakshyam in Sriwass’ direction. Slender beauty Pooja Hegde is the film’s leading lady. Yesterday, the film’s team wrapped up a 15-day long adventurous schedule in Hospet near Bellary, Karnataka. 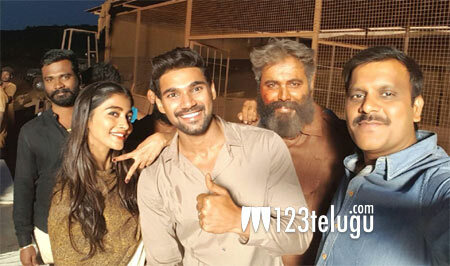 Hotshot stunt co-ordinator Peter Hein had canned several challenging and adrenaline-filed action sequences in mining backdrop on Sai Sreenivas, Pooja Hegde and 200 other artistes. With this, 70 per cent of the film’s shooting is wrapped up. Abhishek Nama is bankrolling this mass entertainer with a lavish budget. Shaktikanth Karthik of Fidaa fame is composing music for this movie.